Gerda Steiner Designs WHERE IS THE CANDY? Clear Stamp Set GSD613 at Simon Says STAMP! GSD613 This item is on reserve until If you would like to reserve this item now, you may purchase it now with the rest of your order. We will hold your order now and ship your entire order as soon as this item is back into stock. If you would like your order to ship now, please place this item on a separate order. Success, Gerda Steiner Designs WHERE IS THE CANDY? Clear Stamp Set GSD613 has been shared! This 4 x 6 inch Clear Stamp Set is so perfect for Halloween. Cat and Puppy are dressed up as ghosts and that owl stole the witch's hat. Gerda Steiner is originally from Germany where she fell in love with whimsical art. She and her wonderful husband moved to California a couple of years after they met. They have three little kids. Gerda has been illustrating for the last eight years. Gerda Steiner Designs feature several animals created through her unique illustrative talents. 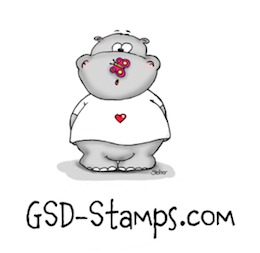 Make a cute impression with Gerda Steiner's unique high-quality stamps for lots of fun paper craft projects.